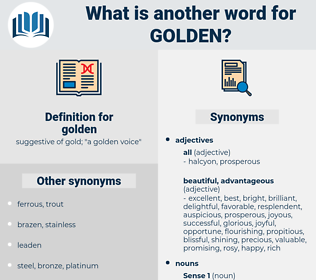 What is another word for golden? suggestive of gold; " a golden voice"
splendid, privileged, God-given, precious, divine, preferential, outstanding. gold, gilded, excellent, wonderful, brilliant, ideal, magnificent, unique. gloomy, unintelligent, dark, disadvantaged, ugly, unaware, dull, unsuccessful, stupid, normal, typical. nonmetallic, dying, gray, funereal, cursed, dismal, low, murmurous, dubious, bankrupt, cavernous, disheartening, achromatic, Languishing, unlikely, tinny, discouraging, miserable, bleak, swart, ebony, glum, hollow, failing, cacophonous, insolvent, comfortless, doubtful, ruinous, depressed, struggling, weak, black, smothered, cheerless, futureless, uncertain, curst, unfavorable, Black-a-vised, declining, brown, faint, negative, swarthy, dreary, neutral, desperate, soft, cacophonic, muted, brunet, dim, raven, unencouraging, grim, thin, nonmetal, wretched, Bankrupted, olive, depressing, unpromising.
" And a golden skull," Rick said.
" And who," said Chetwode, " may I ask, put it into your head to wear an entirely gold dress with your golden hair?"